I love big wallets that will hold more than I should probably be carrying. 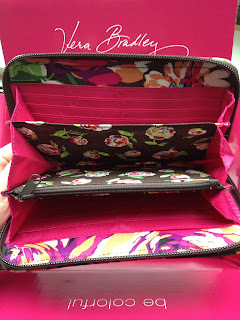 My first Vera Bradley wallet was a Turnlock Wallet in Cupcakes Green. I had that wallet FOREVER. By forever, I mean two years. 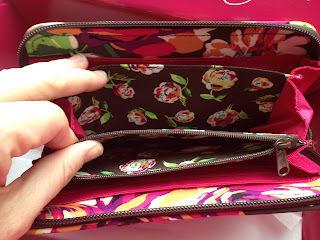 Then I decided that I needed to try the Accordion Wallet because I had heard really good things about it. I bought one off a friend who decided it wasn't for her and I have used it ever sense...probably about a year. It is starting to wear out, so I decided it was time to get another wallet. I had bought a Va Va Bloom Turnlock Wallet a couple months ago, but decided that I wanted to stick with the Accordion Wallet, so I exchanged in last week when I was at the Vera Bradley store. They were out of English Rose, so they were able to order it and have it mailed to me. It arrived last week and now I am just waiting for my current wallet to wear out a little more before I move all my stuff into this one. I thought I would share some photos before I fill it up. You can't help buy smile when you open a Vera Bradley box, they are so bright and fun when you open them up! 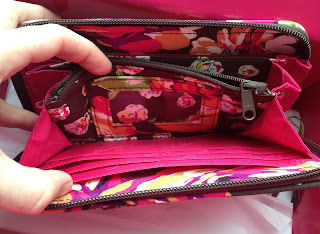 on the right you can see all the compartments of the Accordion Wallet, there are three main sections. This first side hold six cards, has a larger slip in pocket that is behind the credit card slots and the other side of it has a clear window to hold your ID. 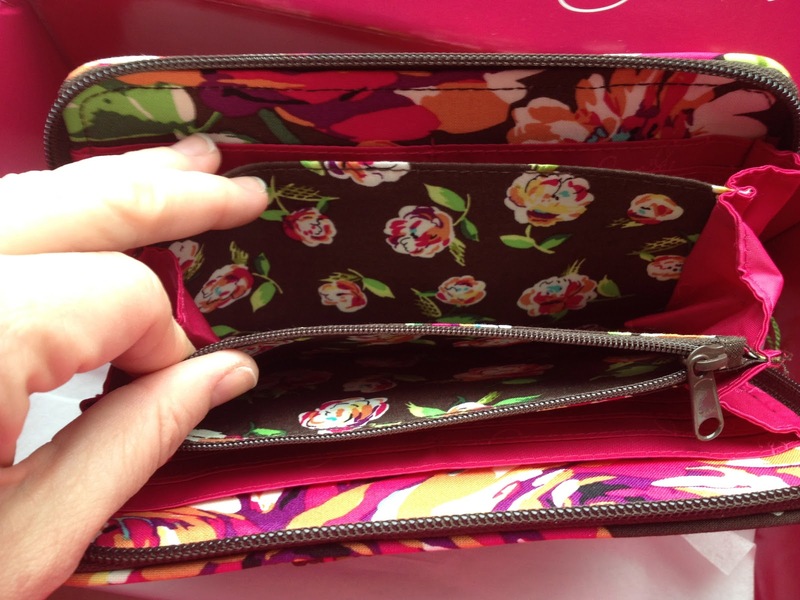 The divider for these sections has the coin purse. 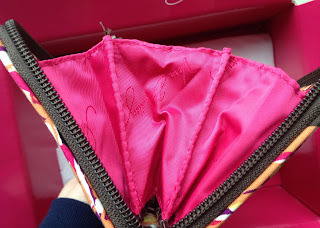 The other side of the wallet has six credit card spots and behind that there are two slip in parts that are as deep as the wallet, so you could maybe hide a folded up $20 bill in there to discover on some rainy day. It opens up nice and wide so you can see everything inside. Just wanted to show off the print on each side! 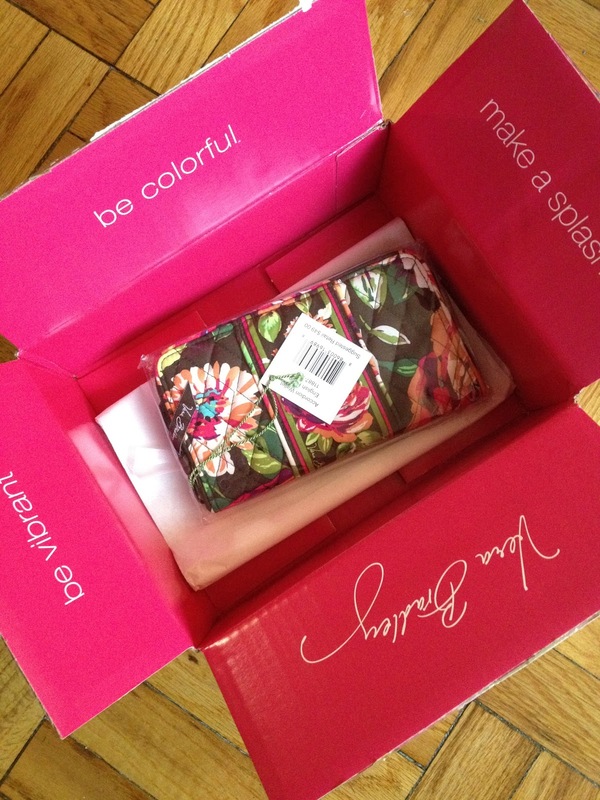 I love this print more and more! 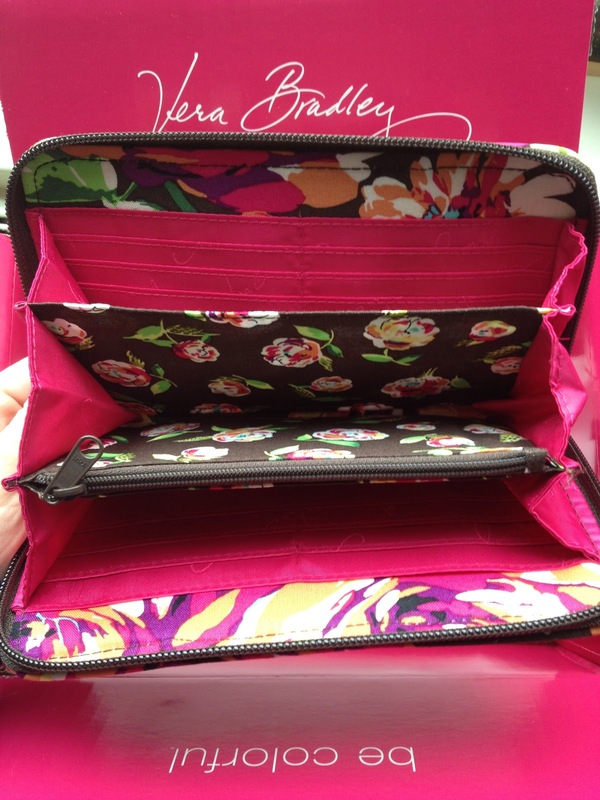 What is your favorite Vera Bradley wallet? I go back and forth with where I like my checkbook, so my two favorites are the Turnlock and the Euro. I love the turnlock because I like to have my checkbook inside of my wallet. The accordion doesn't have that feature, does it? I like the Turnlock because it open flat on the one side. But I have to have a light interior. I can't see my coins in the zippered section when it is a dark color. I love the accordion wallet!!! It is the only wallet I carry. I have it in English rose, Mocha rouge and Watercolor. I love all the credit card slots and that nothing falls out of it when I open it. I'm also able to keep a pen in it and I can zip my phone into it if I don't want to take my whole purse. The Accordion Wallet is my favorite! It holds everything! I have been using the turnlock black microfiber wallet for a couple years and I really like it. 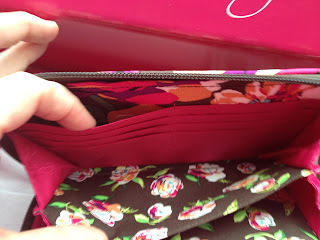 I have a Vera Vera wallet, the Snap Tab, and have really enjoyed it, but the Accordion wallet is what I may choose next. My favorite wallet is the Zip-Around Wallet. 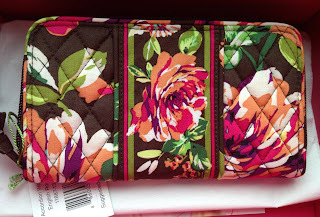 When one wears out, I just get the same wallet in another pattern. I am such a creature of habit - when I find a wallet style I like, I stick to it. 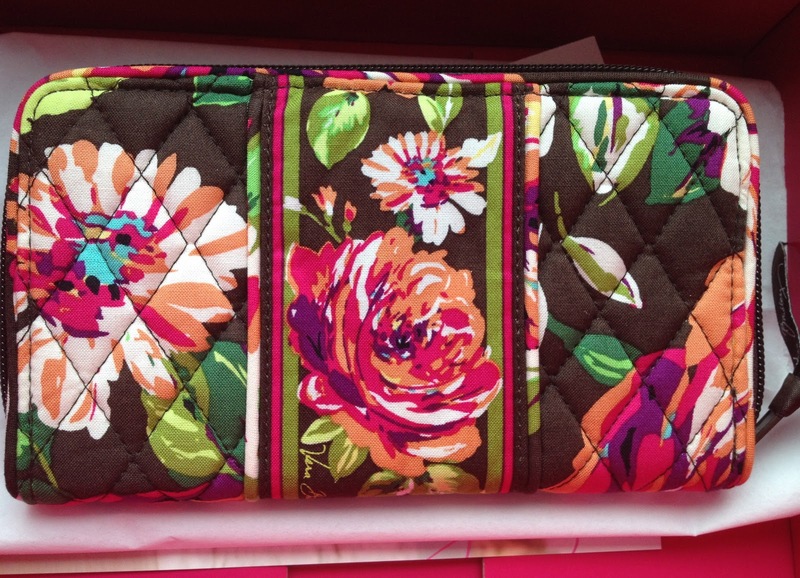 The English Rose pattern is also starting to grow on me.